Mr Chairman, let me thank the members for their continued support to build up a strong defence for Singapore by voting for the financial policy of the Government yesterday. This debate and the next on the Presidential Address after Parliament reopens are crucial. For this debate, it is expected that any proposed tax increase will attract attention. If it didn't, we would be in a different world, a surreal one. But astute Members of Parliament (MPs) have pointed out that the financial budget is but a means to an end. Indeed, apart from the financial scrutiny of Government spending and revenue, the debates will set strategic directions for Singapore over the next ten, twenty years and beyond. And these core issues are addressed at a crucial juncture, as we transit to a fourth-generation leadership that must forge support from a generation of Singaporeans with perspectives and memories significantly different from the pioneer generation, and even that of their parents - because they were born when Singapore was first-world, and they did not experience a third-world Singapore. As we deliberate on these key issues, we have to decide what we must never let go, lest we weaken the foundations of our growth, and what we must change to keep relevant with the times. Those decisions from these two debates will affect every Singaporean, young or old, right or wrong. 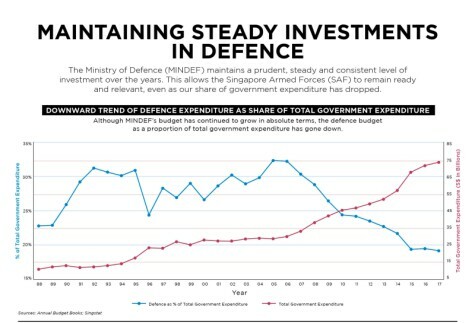 Every Ministry therefore, including and especially defence which takes up a large share of Government spending, must deal with these core issues. That's the core debate. Mr Vikram Nair captured the essence when he asked of my Ministry what are our security plans in the face of wide-ranging threats and risks, and if our defence spending is adequate and sustainable. He used the word 'existential' twice, and he is correct. Should we continue to put defence spending as a priority? Because after all, we have had peace for 50 years and more now. Our relations with neighbours are good on all sides. We have formed strong partnerships, as members have pointed out, with major powers. 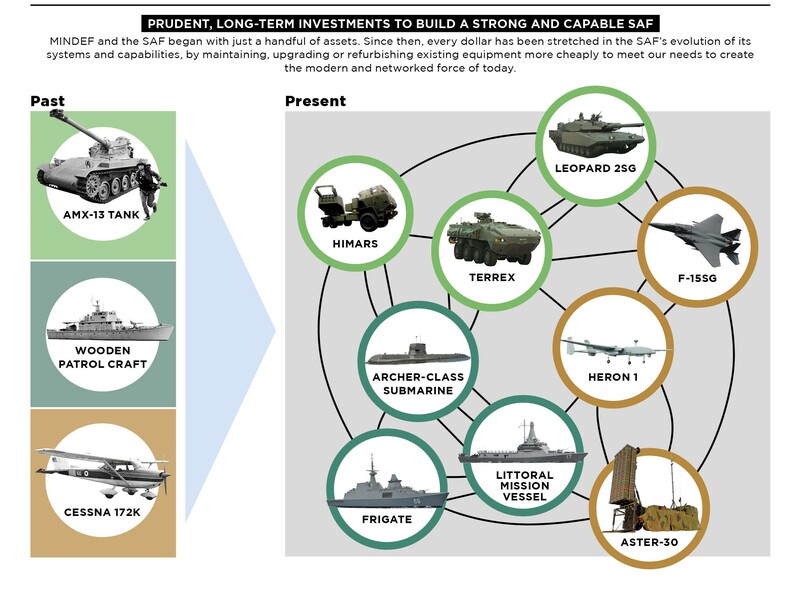 How much should we invest in building a strong Singapore Armed Forces (SAF)? How much can we afford? The answer to these questions by previous generations was plain, as it was unwavering - defence was a top priority and they invested heavily into building a strong defence, a strong SAF, no ifs or buts. But let me make one fact clear, past generations did so even when there were many competing needs. We talk about our rising needs, but as a third world country, our needs then were dire and everywhere - houses, schools, hospitals, roads, public facilities, jobs, all in short supply. And because our military capabilities at independence were next to nothing, the Government of the day had to make hard decisions - every dollar spent on building up the military was a dollar taken from other needs. And yet, they paid the price to build up a strong SAF. Why? Mr Lee Kuan Yew and the pioneer generation who lived through Singapore as a British colony, under Japanese occupation and as a part of Malaysia held a deep conviction on self-determination through a strong defence. At National Day Parade (NDP) which members here attend, we replay a particular clip of Mr Lee's - it is a very stern admonition, and at this coming NDP, I invite you to listen to it again. It was uttered in 1967 when National Service (NS) was introduced, "If you, who are growing up, do not understand that you have got to defend this, then I say in the end, we will lose. Other people will come, smack you down, take it over." I can't say it as harshly as Mr Lee did, because that generation lived through difficult times. It's just unnatural for us but when he says it, and when the pioneer generation says it, it's so authentic. Harsh words for harsh times, but ever so necessary, not only for that generation, but I think for every generation. So, listen for that clip again this year. And with that deep conviction and sacrificial commitment, we today have a modern and professional SAF. From two infantry battalions - which if you read Mr Lee's memoirs were still under Malaysian command even after we separated - we now have an Army, combined arms divisions, fully manned and able to move at short notice. Earlier this year, you may or may not have noticed, we activated a mass mobilisation exercise. There was not much of a fanfare, in fact it may have gone unnoticed, but in 48 hours we were able to rapidly assemble and equip 8,000 men - move munitions to them, and we used new ways of doing it. Many of you here are operationally ready national servicemen (NSmen) and have gone through mobilisation and equipping exercise (MOBEX). The NSmen went to the automated counters, which takes a picture of you, issues you a slip to say which company and which platoon you go to, and what your role is and what weapons you need to draw. At the same time, we activated supply facilities that pushed logistics, weapons, platforms, to them. Within 48 hours, we mobilised 8,000 soldiers - no mean feat, anywhere. That should give a lot of confidence to members in this House and to Singaporeans. From two Cessnas, and the Republic of Singapore Air Force (RSAF) celebrates or commemorates its Golden Jubilee this year - when we started we had two Cessnas, we didn't really own them, we leased them from the Singapore Flying Club. Today we have a fleet, a comprehensive fleet, of fighter, transport, surveillance aircraft and ground-based air defence systems that protect our skies 24/7. After 9/11 we took that threat seriously, and if there are planes that come to us, unplanned - our fighter planes are mobilised, and from time to time we gently guide errant, sometimes lost pilots down, but you will never know when there might be a real attack just like 9/11. Our Navy started with two wooden-hull boats, but we now have modern navy of Littoral Mission Vessels (LMV), frigates, and submarines that protect our waters and maritime hub. The commitment of previous generations to build up a strong SAF was not merely through words or aspirations. It required substantial financial resources from the Government and the people. But that was not the only resource, and in fact not the most precious resource they had to give. They gave of themselves, as every Singaporean male, as every male MP in this House who has done NS has done so, through NS with the full support from family and as employers. The results of that unequivocal commitment are plain for everyone to see - to Singaporeans, to our neighbours and indeed globally - an SAF today that is able to defend Singapore, but beyond that, an SAF that has contributed to global security. As Mr Vikram Nair said, how do we show that we are a valued partner? It went beyond our wildest imagination that SAF troops and assets, as Mr Teo Ser Luck pointed out, could assist after Hurricane Harvey in Texas and Hurricane Katrina; or could be deployed as peacekeepers in Timor-Leste or against terrorism in Afghanistan and Iraq, against pirates in the Gulf of Aden, and in humanitarian efforts in Aceh and Nepal. Who would have thought of it when SAF was started more than 50 years ago? We will continue to do this because the partnerships forged from playing our role internationally are important in dealing with transnational threats that affect our own security. We are not playing "good guy". It raises our stakes, our value to others, who will then want to help us as we deal with transnational security threats. It has been the steady investments in defence spending that enabled these achievements by a strong SAF, both locally and internationally. This is a Committee of Supply (COS) debate, so I think some details on actual financing are appropriate. We've handed out, with your permission, Mr Chairman, charts. 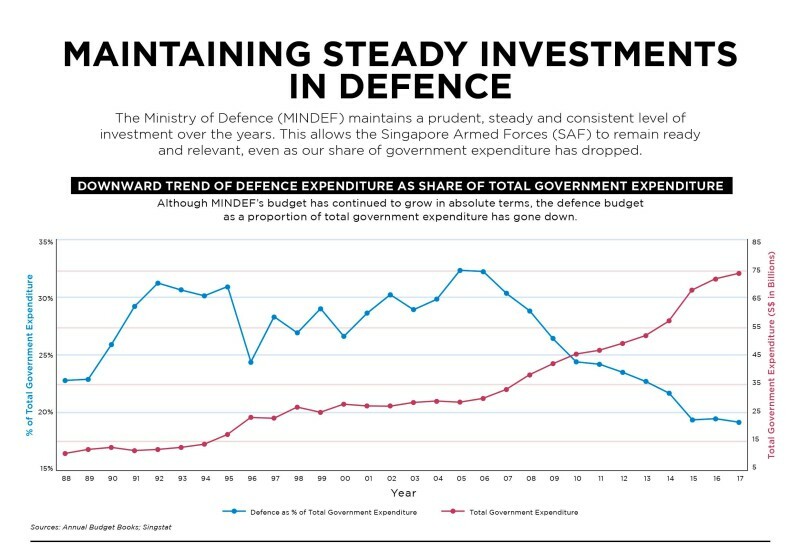 The first figure (Figure 1), and I'll show them as well on the screens, shows our defence spending for the last 30 years. First off, in blue, is the percentage of Government expenditure - how much the Ministry of Defence (MINDEF) spends as part of Government expenditure. At its height, you will notice that we spent almost a third of every dollar the Government spent. Click here for the full statement, with graphs, on the Singapore MoD website.